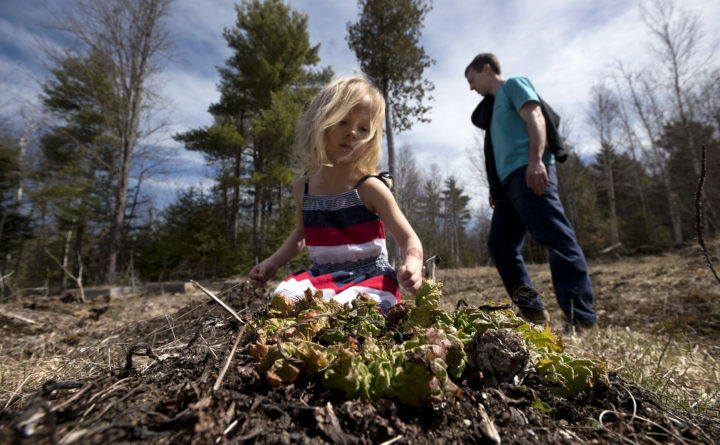 Lucy Garland, 4, checks out the rhubarb patch as the plant barely poked out of the soil in her family’s garden in Clifton. Lucy’s parents, Josh (right) and Kate Garland decided to scale back their garden temporarily as they are busy with Lucy and their newborn Sophie and full-time jobs. Kate Garland holds her newborn, Sophie as her 4-year-old daughter Lucy plays near by. Kate and her husband Josh Garland decided to scale back their garden temporarily as they are busy with Lucy and their newborn Sophie and full-time jobs. They will use methods that will preserve the garden instead of letting weeds and saplings take it over entirely. Lucy Garland, 4, plays in the water near her family’s garden in Clifton. Lucy’s parents, Josh (right) and Kate Garland decided to scale back their garden temporarily as they are busy with Lucy and their newborn Sophie and full-time jobs. They will use methods that will preserve the garden instead of letting weeds and saplings take it over entirely. Last summer, horticulturist Kate Garland’s home vegetable garden looked just terrible. But to be fair, she had a lot going on. 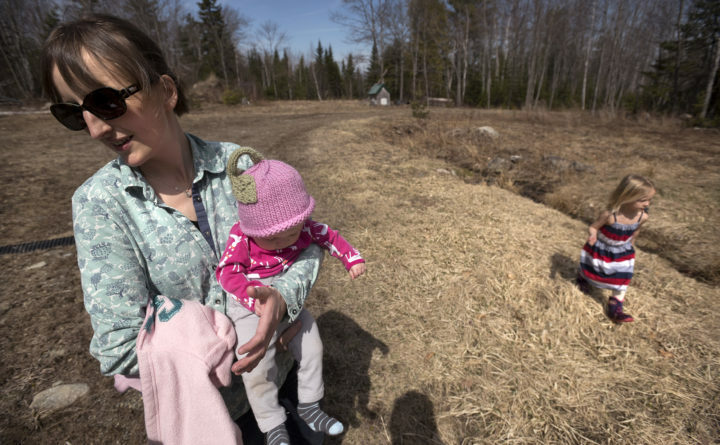 At the time, the University of Maine Cooperative Extension educator was pregnant with her second daughter and busy trying to keep up with her first, a firecracker of a 3-year-old named Lucy. She and her husband, carpenter Josh Garland, had full-time jobs and when they weren’t at work, they were doing house projects at the old family camp where they live or building their new home on a dirt road in Clifton. “Something’s got to give,” Kate Garland said recently. What gave was the garden, though it took her awhile to admit the truth of what was going on. In past seasons, she and her husband spent many endless hours cultivating more than 3,500 square feet of juicy tomatoes, crisp peas, tender beans and so much more. But not last summer, when too many vegetables were left unweeded, unwatered and unharvested. So this year, Kate Garland is hoping her garden travails can help others who find themselves in a similar predicament. 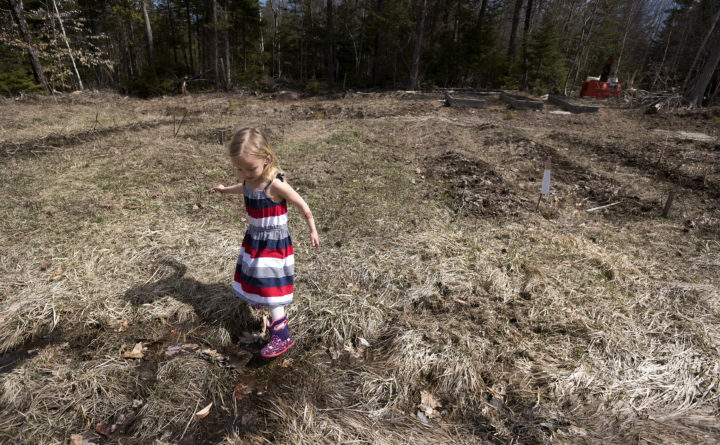 She’s turning her attention to what could almost be described as “ungardening,” or preparing her unused garden plot in a way that will keep down weeds and keep the soil in good shape for the future. She is happy to share what she is learning about how to best do that so that an unused garden can easily return to production one day. Sometimes people take a break from their gardens because lives got hectic, as was the case for her. They might be traveling during critical planting or growing times, or have simply lost their garden moxie after the death of a spouse or while caring for elderly relatives. The two large garden plots she and her husband used to work had been woods and fields not so long ago. They bought their property in 2006, and that summer they had their first garden. It was a big effort to turn the rocky dirt into productive soil, Kate Garland said. They scraped up the dirt from the garden plot and screened it to remove the rocks, using a chain link fence set on top of a frame. They also tested the soil’s pH and then added organic material to make it the most productive it could be. It would be a shame to lose all that work, she said, and so they are taking concrete steps this year to protect their dirt and time investment while they plan a busy summer of camping trips, family and fun with Lucy, now 4, and her baby sister Sophie. — Mulching some of the beds with 5 inches of shredded leaves or straw. She is planning to do most of her mulching with leaves that she will shred with a mulching mower, a leaf shredder or by carefully using a weed whacker in a plastic bin. According to Kate Garland, shredded leaves will decompose and stay in place better than unshredded leaves. — Placing large pieces of cardboard, also salvaged from their house project, on the permanent walkways they have established between garden beds then covering them with wood chips. Garland said that having permanent walkways between 4-foot wide beds helps reduce the amount of compaction in planting areas, which in turn can minimize or eliminate the need to do mechanical cultivation. — Planting cover crops strategically on some garden beds. The Garland’s garden is plagued by crabgrass, an annual weed, and they will try to suppress it by a quick-growing crop of buckwheat. They’ll mow that buckwheat back about 10 to 15 days after it begins to flower in order to keep the seed from becoming a nuisance. They then plan to follow buckwheat with a crop of oats to finish the season. — Mowing along the margins of the garden to avoid adding weed seeds to the soil.